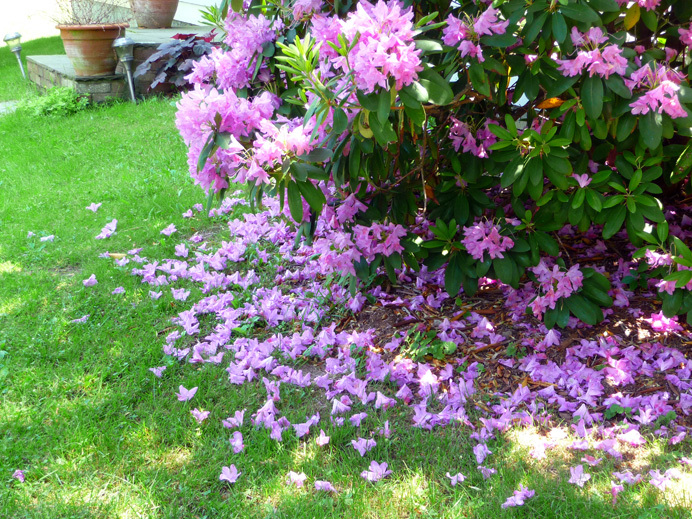 The most beautiful rhododendron on my walk, at the corner of King Street and Middle River Road, is losing its blossoms. Several times during the past week, I've stopped to stand in its bluish-pink shadow and listen to the humming of bees working the blossoms. On some of those days, bumblebees dominated. On others, I saw only much smaller bees of a species that I couldn't identify. I wonder, do rhododendron produce two kinds of nectar that attract two kinds of bees? That would be a clever stratagem to ensure its survival. I still don't know the answer to this question, but I did find a fascinating article on the evolution of rhododendons, which argues that they probably originated in the Himalayas between 50 million and 68 million years ago. .